Le Rêve Events and Pool Party Venue is designed to house small sized events (200 or more people).It is an ideal venue for corporate and social events such as sales meetings, product launches, testimonials, anniversaries, corporate parties, weddings, debuts,birthdays and other celebrations. Located in the heart of Quezon City, near ABS CBN, GMA 7, residential areas, offices, churches and schools, the venue is accessible to public transportation and has parking spaces for private vehicles. 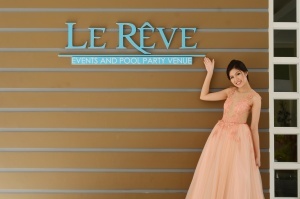 Le Rêve Events and Pool Party Venue offers several choices: the air-conditioned Main Hall that can seat 180 people;the al fresco Poolside venue with a swimming pool for 100 people, and the Courtyard that can be transformed into a garden party that can seat 120 people. “Le Rêve” means “the dream” in French.The French-inspired design of the façade, the fountain and the gardens add to the dream-like ambiance that is a perfect backdrop for any party. It is also a possible photo-shoot location. The Main Hall with high ceiling, staircase and entrance foyer may be decorated to suit whatever theme the client prefers. Le Rêve Events and Pool Party Venue has accredited caterers to handle the food and beverage requirements. Also on hand are technical support agencies to provide various services during the event.